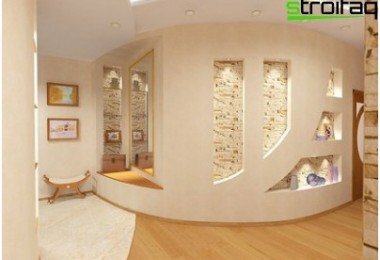 Drywall - a unique material that allowscreate amazing beauty of the design and align complex surfaces. 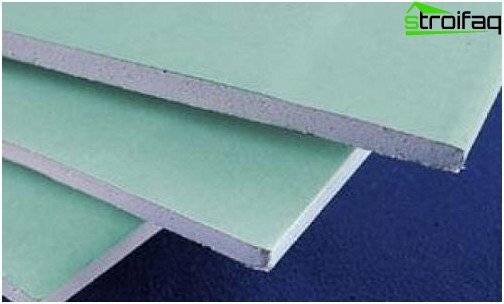 It has heat-insulating properties, absorbs moisture, is characterized by properties such as fire resistance and durability. It should be noted that the alignment of plasterboard walls is much faster than with other methods of finishing. During repair work should take into account some of the features that are typical of this material. The methods of "dry" alignment. Features of alignment with the frame. Specificity of fixing plasterboard without frame. 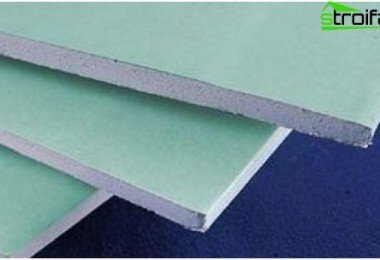 Modern technologies allow to produceOnly conventional and fire-resistant gypsum boards, and water-resistant, which allow the alignment of the walls, even in areas characterized by high humidity. 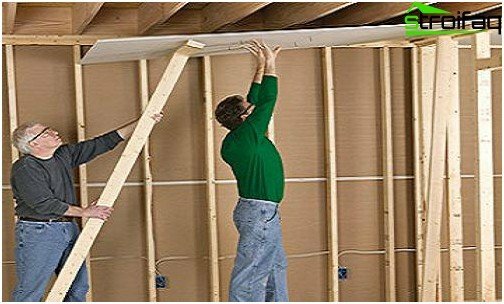 The process of alignment of the walls of drywall is the best solution for walls with large irregularities and level differences. 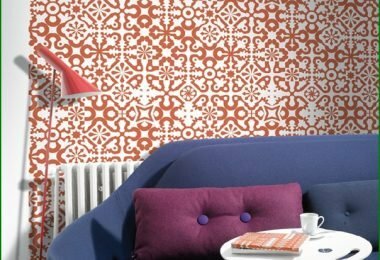 Also, this method is often used for the organization completely flat surface intended for pasting the walls of wallpaper or painting. 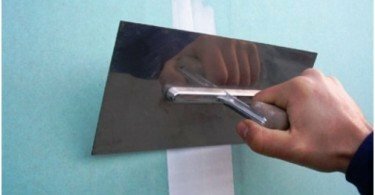 Installation of drywall with a special adhesive. For each of the methods has its own characteristics which determine the choice of a particular type of installation in a particular situation. If there are significant irregularities on the surface of the wall is better to use the alignment with the carcass. It can be assembled from metal profiles or wooden beams. The wooden frame has several drawbacks: more complex manufacturing process technology, the need to use the dried wood well, since otherwise the lead frame and on drywall surface cracks begin to appear. On this basis, for humid rooms it is obligatory to use frame made of metal profiles. After selecting the method to be forecastmaximum load, which must be renewed to maintain the wall. increased load locations should be strengthened by mortgages of plywood or boards. The use of metal profiles allowsto carry out the alignment of the walls of any shape or design. To work need to guide and rack profile. The guide profiles are arranged in a horizontal plane by attaching them to the floor and the ceiling parallel lines. The first step is to fasten the profile to the ceiling surface, then using the plumb profile attached to the floor in strict compliance level. The fixed guide profiles are inserted at intervals 0,4-0,6m rack. 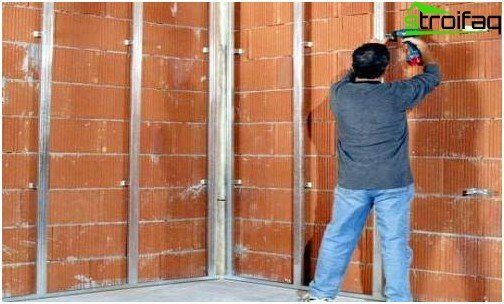 Depending on the available height of the wall profileyou need to shorten or lengthen. The peculiarity of this method of alignment of the walls is a strict adherence to the vertical orientation of all profiles, which is determined by the level at the end of his attachment to the metal profile. To ensure the quality of the assembled frame profiles need to rack mount for hanging. It is important! If the room are the water pipes or steam heating, in places where they intersect with sheets of drywall should establish a special sleeve. Attach a sheet of drywall to metalprofiles made screws for metal, made of anodised alloy. When screwing them to be a little to drown her hat, but do not need much pressure because of the risk of damage to the gypsum board. Using the method of optimal framesuitable for areas that require additional insulation. After the completion of the frame assembly between racks stacked mineral wool, cork mats or other materials that provide good insulation and soundproofing. 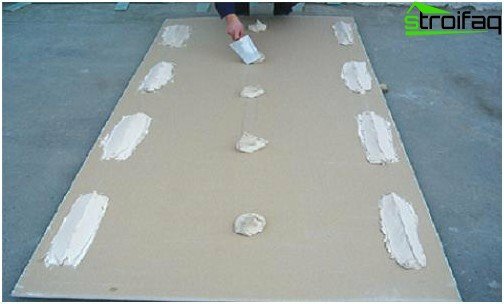 For this method, attachment sheetsIt uses a special plaster or cement glue. 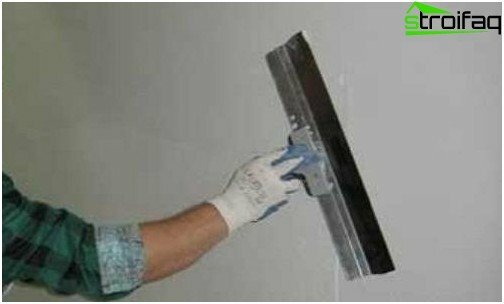 Before you spend leveling plasterboard walls without frame, you need to thoroughly prepare the surface. It is necessary to clean it from the residues of substances that prevent the manifestation of the adhesive bonding properties. Wet the wall should be allowed to dry thoroughly. 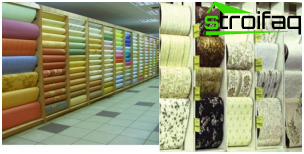 You also need to prime the substrate, if it is made of materials with a strong absorbent or smooth surface. Be aware! With the combination of wet and "dry" plaster work first performed for applying wet plaster to the required areas. The first step is cut into sheetsplasterboard with specified dimensions. Optimal setting adhesive requires clearance from the floor - 10 mm Ceiling - 5 mm. Mixing the adhesive should be conducted in strict accordance with the guidance material to a consistency reminiscent of a thick cottage cheese. Before starting work, gluing sheets of drywall should be removed switches and outlet boxes for a few centimeters. 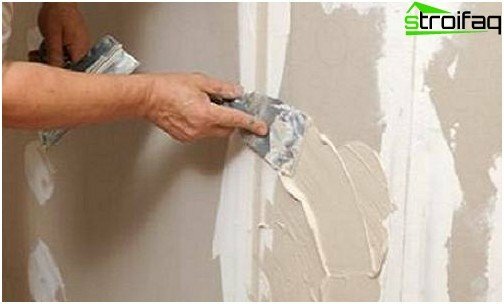 For quality of gluing drywallsheets to the surface of the wall should be put down the so-called beacons, ie, drill a hole into which you want to insert anchors, and then fasten the screws on the level. This is to ensure a smooth arrangement of sheets vertically, as the cap screws are not allow to escape deep into the canvas. 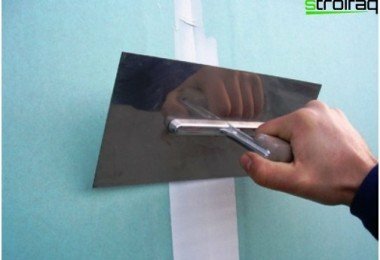 The adhesive is applied evenly to the back sidepaintings, special attention should be paid to the door and window openings, ventilation tunnels and so on. plasterboard plates coated with glue should be put to the wall and close to dock, using this tapping a rubber mallet. With fabric level need to be aligned in a vertical plane. Important! Alignment of plasterboard walls without frame can only be used in rooms with a ceiling height of which does not exceed the height of the gypsum boards as well as the creation of horizontal joints in this method is unacceptable. Using frameless method requirescertain skills at work, but with the help of this method results in savings of space (at least 3 cm), which would take the frame. However, the most popular among the ways alignment still received the installation using the profile. After installing drywall sheets on the wallcheck the web for the presence of flaws, the main of which are projecting the cap screws. They need to tighten up until the end, to ensure a perfectly flat surface. At the final stage, it is important to align the joints betweensheets zashpatlevat place screwing screws. To carry out these works will need reinforcing tape. When laying on the joint should be prepared to press the little trowel in the first layer of putty, should be covered with an additional layer. After drying putty can proceed directly to the Shpatlevanie gypsum boards. Finishing Shpatlevanie may be waived ifWall will be glued tiles. The end result of work performed is a smooth surface that provides huge scope for creative design ideas. 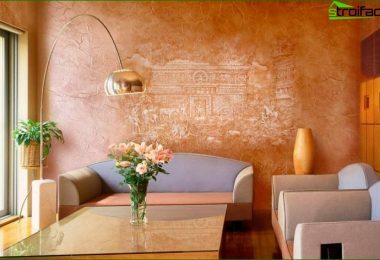 Of the modern features to visualizepresent alignment of walls with plasterboard - video tutorial has a leading position. The visual perception of the features of the process will perform this type of repair work yourself.